On 1 October 2015, Professor Michael Keith, Co-Director of Oxford University's Future of Cities Programme and Director of Oxford University's Centre on Migrantion, Policy and Society (COMPAS); Dr Igor Calzada, Lecturer, Policy Advisor & Research Fellow of the Future of Cities Programme; and Dr Samuel Chen, Director of OSE received a 16-member delegation from Ningbo, China at the University of Oxford. The Chinese delegation was led by Mr Xiubo Shi, Deputy Chief Engineer, Deputy General Manager, and Senior Engineer at the Ningbo Municipal Institute of Surveying and Mapping; Mr Feng Gao, Deputy Director at the Ningbo Municipal Centre of Planning and GIS; and Mr Jianjun He, Deputy Director at the Ningbo Municipal Institute of Urban Planning and Design. 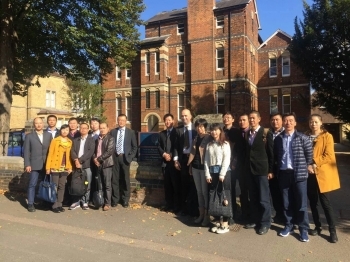 Dr Calzada introduced to the delegation the work of the Future of Cities Programme at Oxford, after which Mr Gao and Mr He gave talks on Ningbo's smart city and big data development. The two sides discussed about how Oxford University may contribute to smart city and big data development in Ningbo.